This stratovolcanic island in the Pacific is part of the Solomon Islands' Temotu Province. 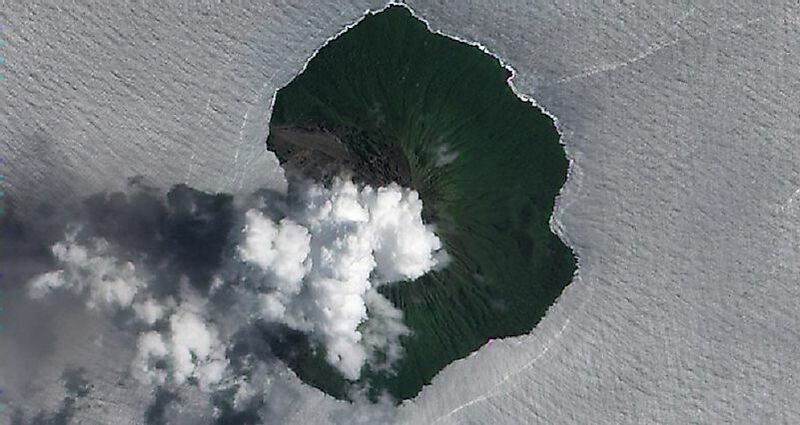 Volcanic activity on Tinakula as seen from outer space. Tinakula is a volcanic island in the Pacific Ocean with an active stratovolcano forming the primary feature of the island. The island is 3.5 kilometers wide and rises to an elevation of 851 meters above sea level. The island is located north of the Santa Cruz Islands and is part of the Temotu Province of the Solomon Islands. The island is currently uninhabited as it is a dangerous place for human habitation, with the Tinakula volcano erupting every hour, exhaling huge volumes of rock and ash during its activity. Reports of the existence of the Tinakula volcano goes back to 1595 when Álvaro de Mendaña, a Spanish explorer, sailed past the volcano. In his reports, he mentioned seeing a volcano that was huge in dimensions and had a well defined peak. He also observed the volcano in its active state. Several attempts have been made by people to inhabit the island in the past but the highly active nature of its volcano has always managed to frighten people and forced them to flee. A massive eruption of the volcano in 1840 completely wiped out all signs of previous settlements on the island and pyroclastic flows swept across all parts of the island destroying everything that came its way. A fresh attempt to inhabit the island was made as recently as 1951 by a group of Polynesians from Nupani and Nukapu. The population underwent a gradual growth to 130 individuals when again in 1971, the people had to flee as another major eruption struck the island. Another attempt to settle on the island was made in the 1980’s but that too was quite unsuccessful. Today, tourists to Solomon Islands often sail past the island in order to watch an active volcano in action. Boulders hurtling down along the sides of the volcano can be also observed during an eruption. Some daring tourists also land on the island where they explore the place on foot. Since the island lacks fine beaches for landing boats, tourists often need to swim from the sea to arrive at the island. Large areas of the island are covered by forests while some part of the landscape towards the west of the island is covered in ash. The Tinakula Islands experience a warm, tropical climate with very little seasonal variation in temperature throughout the year. Though very few studies have been conducted to understand the nature of flora and fauna of the island, scientists estimate that the island is part of the range of the Santa Cruz ground dove (Gallicolumba sanctaecrucis), an endangered bird found in the Solomon Islands and Vanuatu. The Tinakula Island is currently one of the few uninhabited places in the world where threats to human habitation come from the highly active nature of its volcano. The island is also in the earthquake belt of the world, being part of the Pacific Ring of Fire. Global warming and the resultant rise in sea levels could also submerge the island in the future.